In a land filled with magic, where everyone* is born with an ability to control magic, the dream of every boy is to be in the Wizard Knights and eventually the new Wizard King. Asta and Yuno are two orphan boys who have grown up in a small church in the village of Hage in the Boons. Yuno is tall for a 15 year old boy, but has immense magical abilities. Looked up to by all the younger kids around him, he is the shining light of the church and sure to go far. Asta…….remember that earlier asterisk? Well you see, Asta doesn’t seem to have any magical ability at all. In fact, kids half his age have the ability to control it, but he has nothing. Not from lack of trying, he wants to become the Wizard King so bad that he has no problem in telling everyone he meets, much to their ridicule. Once a year, all the kids that turn 15 that year gather in the Grimoire Tower to receive their Grimoires. It is a day or great excitement and often disappointment when you receieve a Grimoire that is incredible small, showing your limitations early on. Of course for Asta, it is a day that he has been looking forward to for years. It is the day that his abilities will finally come out and he can begin his journey towards becoming the Wizard King! If only. At the ceremony, Asta doesn’t even receive a Grimoire. None have chosen him, again the laughter and ridicule. Yuko on the other hand receives a 4 leaf clover grimoire, the same style one as the first Wizard King. This is meet with joy from the vast majority of the crowd, with a few very unhappy souls that such a grimoire would go to someone of such low social standing. After the ceremony, Yuko is attacked by two of the other kids in an attempt to remove him from the race to Wizard Knights. However Yuko dismisses them easily, far surpassing their magical ability. At that point, however, they are all ambushed by a disgraced Knight who now goes around stealing Grimoires and selling them on the black market. Trapped and unable to do anything, Asta makes…an entrance to save the day. His physical abilities do help him but he eventually ends up badly wounded and close to giving up. Then his Grimoire appears before him. A five leaf Clover. The fifth representing the Demon. The first episode, I found Asta to be loud and annoying, actually exactly how Yuko describes him at one stage in the episode. The setting is good for this show and it seems like something that will be a good binge watch. As two main characters go, it is a fairly obvious set up. One – Tall, quiet, handsome, powerful. The other – Short, loud, laughed at and weak. It almost reminded me of the initial episode of Pokemon. Where the main character is extremely determined but already a few steps behind the other character. Now that is probably going to be where the similiarities end, but who knows. This is one to watch, and proving to be one of the more popular shows as well with good reviews all around. So if you are looking for something to binge on, give this one a go. Let us know in the comments whether you have already watched it or you are about to, and then call be and let us know what you thought!! In another world, just like countless times before, 12 warriors converge on a designated location. The purpose, to kill everyone and be the one person standing. The stakes, a wish fulfilled… any wish. 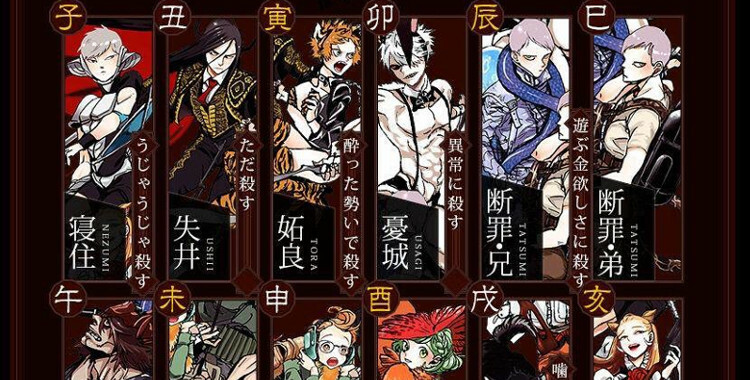 This is Juni Taisen (12 Wars). If you crave wanton violence with a Japanese flare that only anime can deliver, this is a must see. 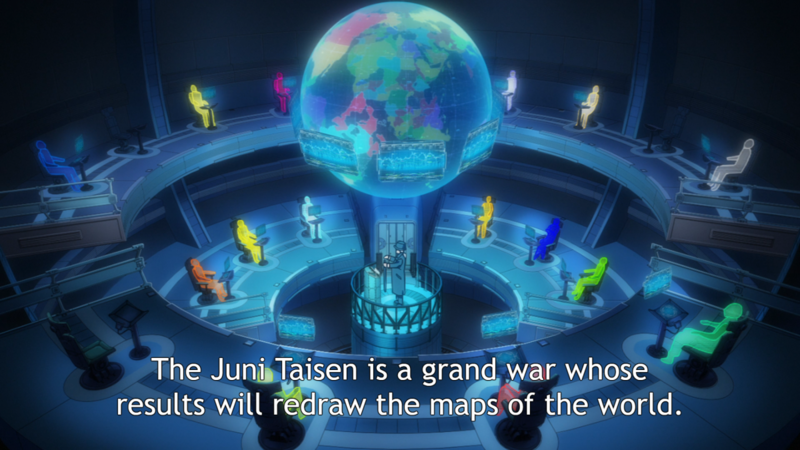 The best way to describe it would be like a mixture of Kinji Fukasaku’s Battle Royale and Takuya Sato’s Fate/Stay. Each warrior is based off of the Chinese Zodiac and their fighting styles, methods of killing are just as varied. Expect the almost 70s like profile shot before each battle as each character declares who they are and how they kill. You’ll know it when you see it! The fights are short but otherwise satisfying so do not expect any DBZ-like dragging sequences. Just like Battle Royale- or even more closer to Attack on Titan in this respect, you can’t be attached to any single character. Even though it seems that each episode adds insight into each of the fighters. This is a free for all and there are always surprises that lurk in each episode- like who are these guys how seem to be running the event? Juni Taisen is a short romp into almost mind numbing violence and makes to pretense of being anything else. Love it or hate it, the 12 episode run is certainly worth a binge watch.